The World is divided into 3 Empires: Chunjo (yellow), Jinno (blue), Shinsoo (red). 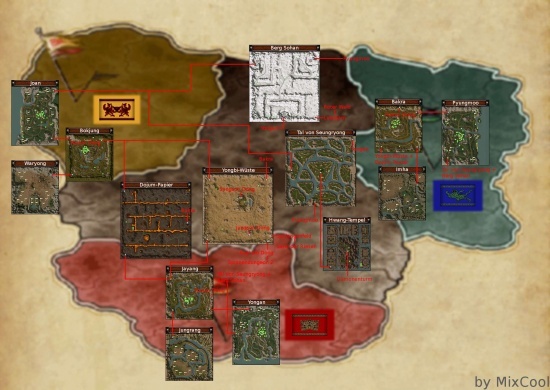 Each realm extends over four maps (Map1, Map2, Guildzone and Guildzone 2), which are connected by portals. There is also a neutral range in that all 3 realms gathers. The Chunjo realm takes the west of the continent. It is a theokratisches realm and by its spirituellen leaders is led. The realm of Yoon Young, the cousin of the former emperor was created. Its wife, who has enormous magic forces, helped it very early to foresee the extent of the threat by the Metin stone. He guessed/advised several times to counter measures, was however always ignored. Thus it led its Gefolgsleute into a rebellion against at that time still existing, entire empire. After bursting the empire, its realm is still in open military conflict with the east and in constant discord with the south. The inhabitants of the Chunjo realm strive for the rule over the entire continent, in order to be able to order so to the increasing power of the Metin stone finally stop. The Jinno realm covers the eastern ranges of the continent. The realm is based on military power, its population is aggressive and martial. The Jinno realm of Ee-Ryoong, the physical son of the last emperor is controlled. It sees itself appointing to re-establish under its guidance and owing to its armed force the old empire. Fears regarding the meaning and effect of the Metin stone officially ignored in the Jinno realm. Secretly Ee-Ryoong tries however to make itself the destructive abilities of the Metin stone militarily usable. The Shinsoo realm lies in the south of the continent. The principal occupation of its inhabitants is to trade. Developed after the decay of the empire, based of Yoon Yoing, the trade relations with the east led fast to a bloom. With the west the inhabitants in constant discord and the trade route live are interrupted. In the consciousness of the threat of their base of life by the Metin stone, the dealers rigged. Their goal is it to be able to carry out for the western attacks resistance to open the trade route again and the entire realm under their rule to one. This page was last modified on 9 February 2017, at 01:48. This page has been accessed 164,572 times.